For the second time now, I’ve ventured to Florida to scratch some salty critters and experiences off my fly fishing bucket list. Instead, the trip has only fanned the flames and fueled plans for future trips to the sunshine state. The six-day trip included four days of fly fishing. Day one was in the Everglades with Capt. Jason Sullivan of Rising Tide Charters. This first day with Capt. Jason was day five of the Everglades for me and the continuation of a determined pursuit of a tarpon on the fly. Last year, I lived aboard a mothership for four days deep in the backcountry of the Everglades. Stu Apte and others aboard the vessel furthered in me a passion for a specie that I had yet to catch. The weather had turned off the fishing, and the megalops eluded me. This year was different. The weather was prime, and we immediately found rolling ‘poons nearly immediately, and by 9:30 AM on day one, I was hooked up with a 50-60 pound tarpon. Mission accomplished. Later in the day there were more shots at tarpon, a nice snook landed, and I enjoyed the company of a number of sharks, including about an 8-foot bull shark that cruised around the boat. There were attempts at catching a lemon shark – no take. For the next two days, I fished the Florida Keys out of Islamorada with Capt. Shafter Johnston of Blue Moon Expeditions. Prior to the trip, my hopes were for a range of species including tarpon, sharks, redfish, barracuda, and ideally bonefish and permit. However, tarpon have a way of making someone lose their mind, and with 100-plus pound beasts cruising within 30 feet of the boat, it’s easy to give up on any previously established game plan. Thus, tarpon were the primary focus for those two days with only a few casts at other species, notably about a 40-pound permit that got away. At the end of day three, some wind came in to throw everything upside down, and I decided to head north to visit the Nautilus Reels factory. As always, the factory visit was worthwhile, and Kristen Mustad surprised me by having me follow him to a canal for some evening fly fishing. 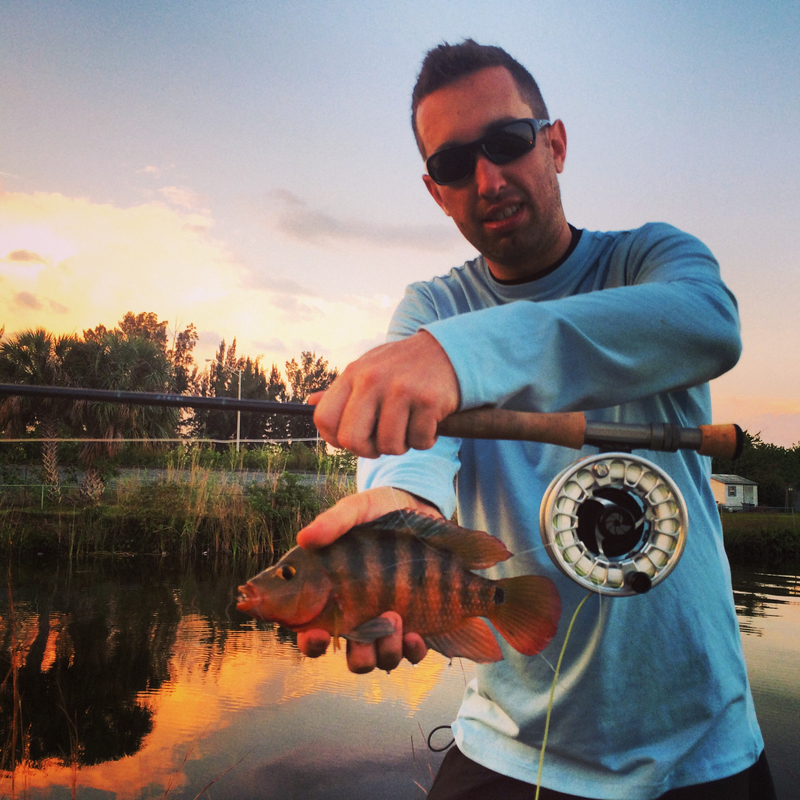 Resident tarpon, peacock bass, and other fish hang out in the Miami canals, and it was a blast to cast to some Mayan cichlid – a cool and colorful invasive specie in South Florida. Finally, day four brought offshore fly fishing with Capt. Ron Doerr of Bite Me Charters in Jupiter. Capt. Doerr gave me numerous options for species to target, including dorado and spinner sharks, but when albacore were named as an option, I knew that the little tuny had to come before anything else. The swell was a bit to handle initially, but when I got my rhythm down, I brought in a Spanish mackerel then a gorgeous little albie. Shortly after, we got into amberine – catching one after another. These brutes can fight. When we caused enough of a ruckus, a pair of hammerhead sharks cruised in and spent some quality time with us. The larger of the sharks was about a 14 foot (or larger) beast that took all of my attention. (I can’t get enough of sharks). 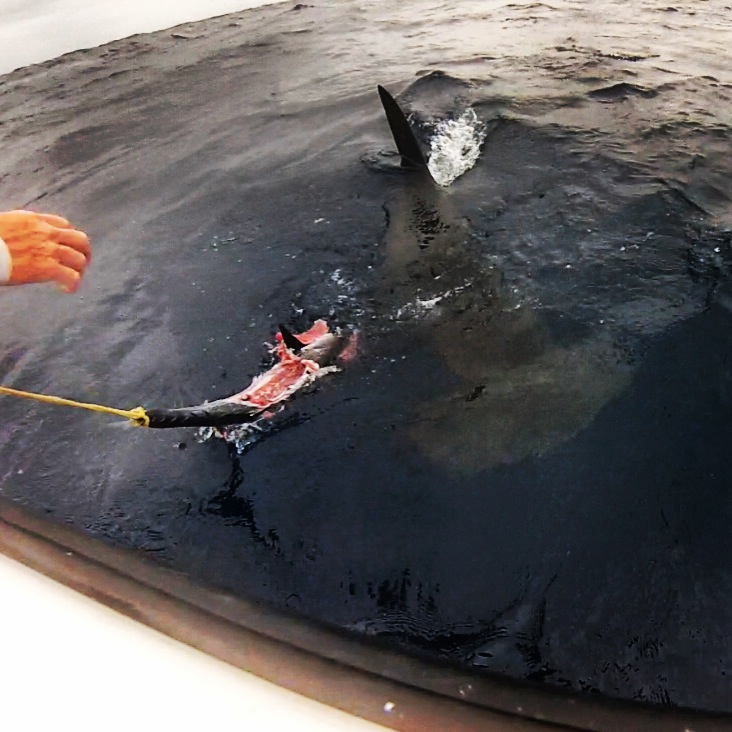 Pulling an old tuna with a rope, we were able to get pretty close to the shark. Gorgeous fish and incredible experience. 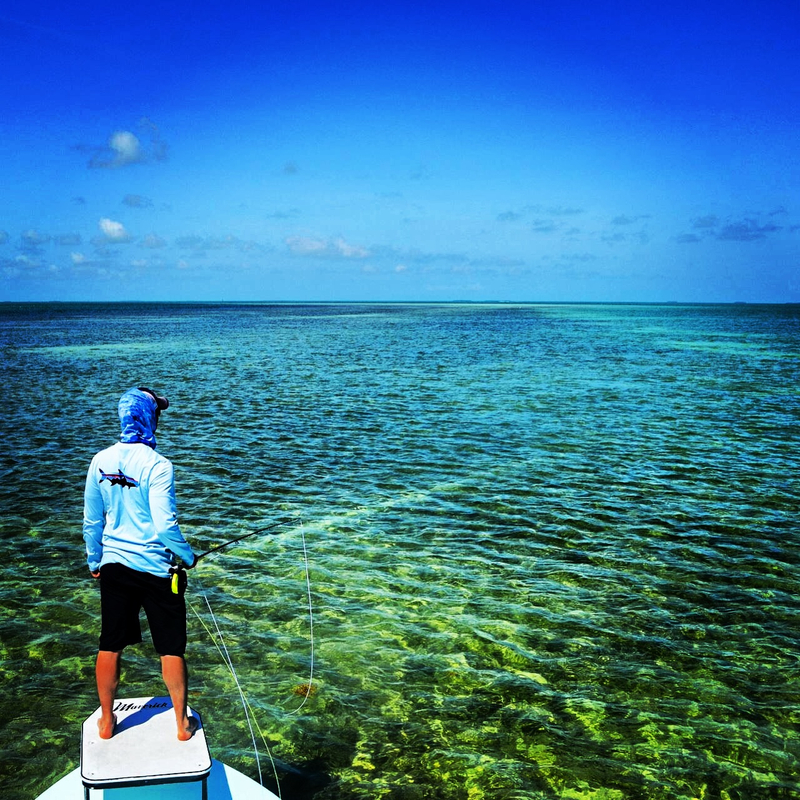 I will be back in Florida for ICAST/IFTD in Orlando, but ‘Glades, Keys, offshore dreams are already putting new plans in the works. Florida on the fly is not a one-time thing. This entry was posted in Saltwater, Trips and tagged albacore, barracuda, Bite Me Charters, Blue Moon Expeditions, Everglades, Everglades National Park, Florida Everglades, Florida Keys, hammerhead shark, Jason Sullivan, Rising Tide Charters, Ron Doerr, Shafter Johnston, shark, sharks, snook, tarpon, tuna. Bookmark the permalink.